What would you pay to invite Elizabeth Joy Roe and Greg Anderson into your living room for a private performance? What would you give to have Jenny Lin providing the music at your next dinner party? 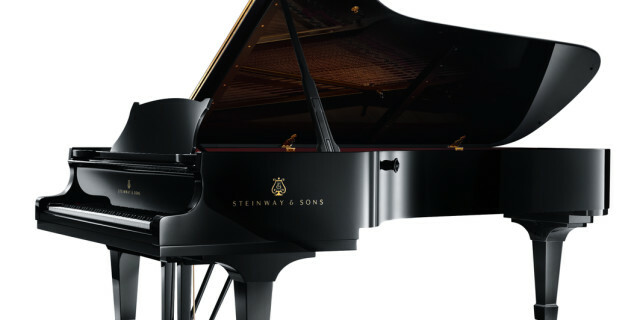 This week, Steinway introduced Spirio, which it hailed as its biggest innovation in its product line in over 70 years. It is a player piano system that reproduces the work of Steinway artists to its most accurate level yet: it has been hailed by artists for accurately replicating the smallest nuances of performance, for bringing a live concert into your home… even while no one sits on the bench. 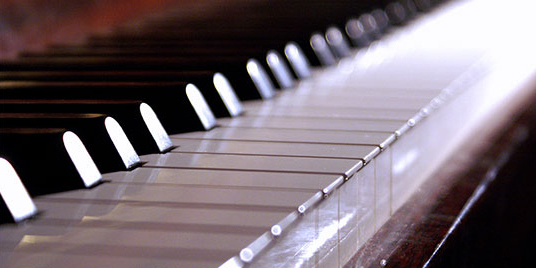 The piano looks no differently than other Steinway pianos: the Spirio components are not visible, nor do they affect the touch or the sound of the instrument. But the piano delivers much more than meets the eye. The piano comes with a catalog of performances from over 1,700 Steinway artists who have recorded pieces ranging from classical to jazz, as well as an iPad that controls the Spirio via an app. The catalog will be updated automatically as new performances are recorded. But, alas, even priceless experiences often come with a hefty price tag. The starting price for bringing these performances into your home? $110,000. Fewer children are taking piano lessons. Associated Press writer David Pitt explores the issue of closing piano stores across the United States and what it means for business and for music. When I was a child, my mother read to me sweet bedtime stories, and I did the same when my two daughters were little. But, as a parent I had something my mother did not, and that was a portable CD player in my children’s rooms so I could play them nighttime classical music to help ease them to sleep. Over the years there have been many musical albums designed to bring both children and adults peaceful sounds into the evening hours. I remember turning the lights down so that the moonlight would shine through the window, with music playing to enhance the beauty of the moonlight. 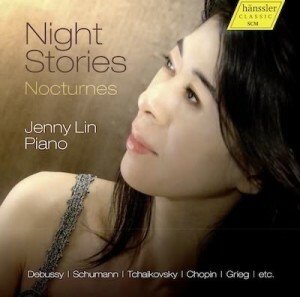 Pianist Jenny Lin’s new album of nighttime piano music is entitled, “Night Stories – Nocturnes,” and proves to be the perfect gentle evening companion for both the young and not so young. Jenny Lin is an outstanding artist comfortable with many genres, most notably from the Romantic, Impressionism and mid 20th century Modernism, all represented here. Beginning with Claude Debussy’s iconic “Clair de Lune,” the tone is immediately set for a splendid hour of musical nocturnal delights from the likes of Schumann, Glazunov, Tchaikovsky, Faure, Chopin, Grieg, Turina, Griffes, Paderewski, Glinka and Liszt. Many of the selections may not seem familiar, but their gentle beauty will definitely warm your senses and inspire your imagination as you spend the evening gently easing away the tensions of the day gone by. Whether or not the music elicits memories of childhood storytelling, this program is a perfect coda to a peaceful evening spent with Jenny Lin’s Night Stories. Ted Weiner is a WDAV veteran. 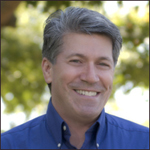 This San Francisco Bay Area native became WDAV’s Music Director in 1991 and has been maintaining the WDAV recording library and choosing much of the music we hear ever since. Night owls and early birds can hear Ted Weiner on WDAV from midnight until 5 each morning on WDAV’s Early Shift on 89.9fm or online. Have You Watered Your Piano Recently? Did you know that watering is a key step in piano care? Get a lesson in a properly watered piano by Davidson College’s Artist Associate Will Fried and Director of Music Production and Promotion Amanda Preston. WDAV Says Goodbye to Beloved Colleague and Friend Ruskin Cooper. On Wednesday, July 18, Davidson lost a kindhearted and talented member of its community. 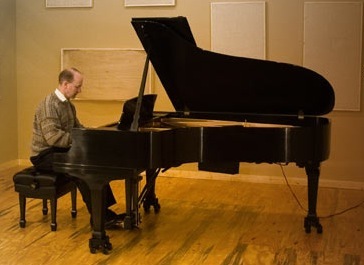 Ruskin Cooper, Artist Associate for piano at Davidson College, passed away peacefully among his family after losing consciousness due to cardiac arrest. Graceful Ghost Rag, by William Bolcom on Friday 7/20/12 at 4:53pm Rhapsody in Blue, by George Gershwin on Saturday 7/21/12 at 11am. Please join us in honoring this wonderful man. Ruskin will be greatly missed, and our condolences go out to his family. To learn more about Ruskin’s many accomplishments and how to pay tribute to him yourself, check out this article from the Winston Salem Journal. On Friday, July 6, WDAV opened its doors to some special guests. 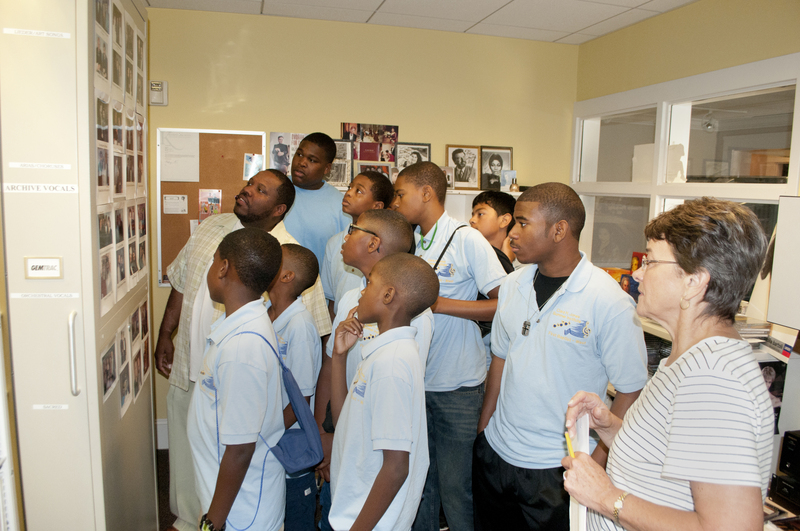 Invited by board member Andrew Adair to tour the station, thirty-eight ten to fourteen-year-olds from the Clara H. Jones Summer Institute – a six-week program that focuses on improving fine arts skills as well as increasing reading, math, and science competency – filed into our conference room in matching turquois T-shirts. After a brief introduction by General Manager Scott Nolan, the group split in half – the boys starting with a presentation on radio and classical music while the girls explored the station. With most of the WDAV staff off at Brevard Music Center to record performances for our SummerStages program, this visit brought welcome activity to what would have been an oddly quiet Friday morning. And we were ready to record this excitement in every form of media possible. 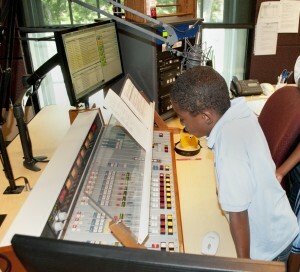 You can hear New Media Assistant George Marshall’s audio adventures with the kids here. 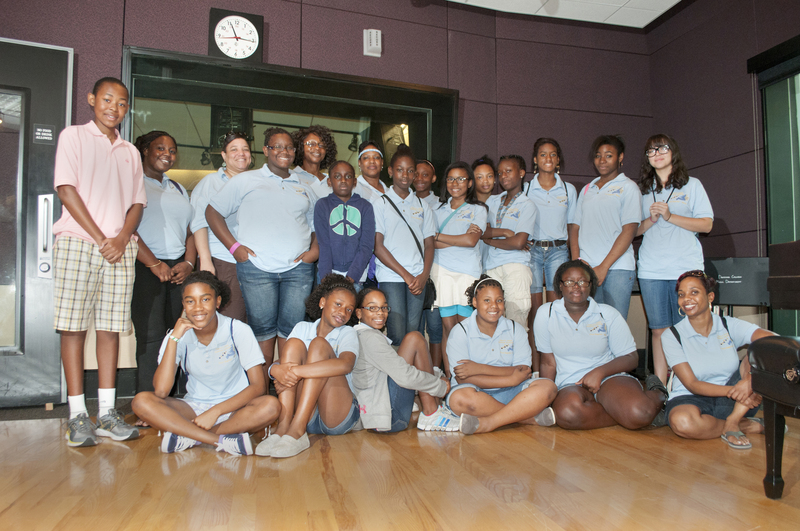 With pen and paper in hand – someone had to do some old school reporting – I tagged along with the seventh and eighth-grade girls on a tour led by WDAV staff member Sarah Demarest. Our first stop was the Music Library, which houses thousands upon thousands of CDs. “Does anyone have this many CDs at home?” Sarah asked as the group gazed at the station’s music collection. Then Sarah joked, “Does this age still know what CDs are?” She does make a good point. Even here at WDAV, we are almost entirely digitalized; our Music Library exists only for backup. Welcome to the twenty-first century. Our next stop was a soundproof editing/production studio. One student tried her hand at opening the studio door, a task harder than it looks. After putting her full weight on the door (and using her foot for some extra leverage), she was able to release the airtight seal, and the door opened. We filed into the room as Sarah began to explain a bit about the audio editing process. The girls listened, wide-eyed and curious. “This is the same kind of soundboard you would use if you were a producer making music,” added one of the Institute’s chaperones when Sarah had finished speaking. “So, if you saw Let it Shine [the latest Disney Channel original movie] and saw him working, this is the same kind of thing.” The room filled with an animated chorus of “ohhhh.” In an inspiring moment of teaching, the chaperone made a connection the girls could easily understand. Suddenly, the world of classical music no longer seemed so far removed from that of pop music. Moments later, my tour group met the fifth and sixth-grade girls – they had been doing the same tour backwards – in front of the performance studio. 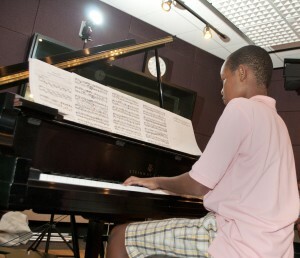 Patiently waiting at the studio’s piano was rising tenth-grader Michael Muchane. 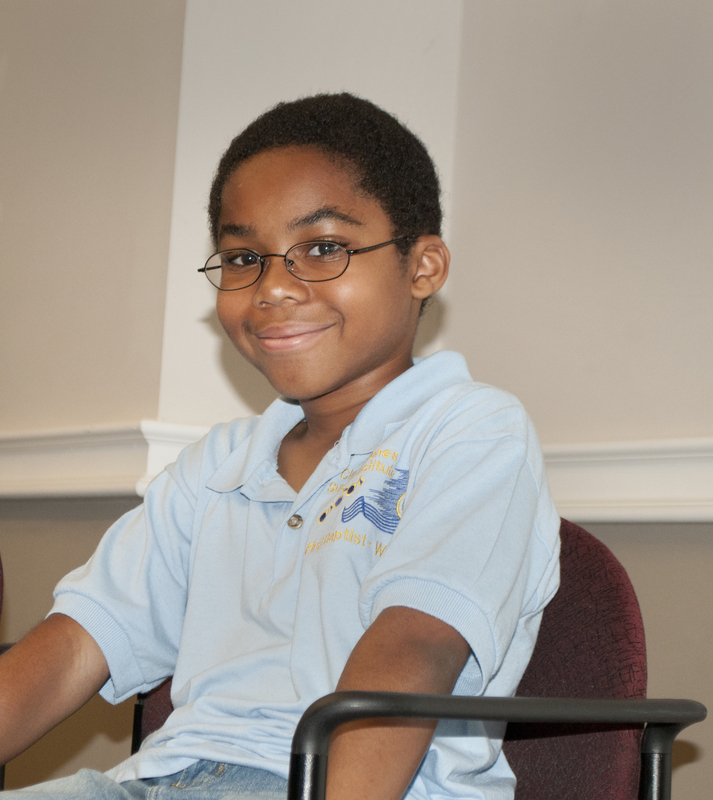 Michael has been playing the piano since age seven. He has competed in local and state competitions, performed large scale recitals, won several awards, and has volunteered his time to play in churches and nursing homes. And luckily for us, he was prepared to give a quick concert. Hear Michael play his three pieces by clicking the links below. 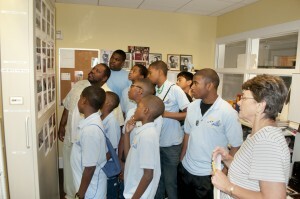 With the tour complete, I followed the girls into the conference room from which the boys had just emerged. Once all twenty-some girls had settled into their chairs, Peter Browne, a WDAV board member, began his presentation, which was complete with props and a PowerPoint. Peter started by ringing a hotel desk-sized bell.
. The group then climbed back on to their bus, collected their complimentary bags of WDAV goodies, and drove back home to Charlotte. *Interested in having your students tour the WDAV studio? Give us a call at (877)333-8990. Hopefully you know all about the Radio Chopin project WDAV launched today in honor of the 200th anniversary of the birth of Fryderyk Chopin. What you may not have heard yet is that American Public Media”s Marketplace also wants to celebrate the date. And they are doing it in style: by broadcasting Jennifer Foster”s essay on “Chopinomics.” Hear it in the Charlotte region on WFAE 90.7FM beginning at 6:30 P.M. or visit the Marketplace website to find it in your area!